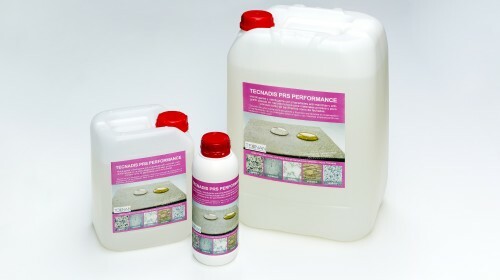 Hydrophobic and oleophobic product for building sector – TECNAN-NANOMAT "Think big, Act Nano"
It also protects against the principal diseases caused by the action of water and moisture (efflorescence, leaks, growth of microorganisms or premature deterioration of building materials). Applicable in repairing works of roofs and terraces avoiding excessive and/or cumbersome tasks regarding floor (tiles) and asphalt foil removal, to avoid possible problems caused by water. – Totally respects the structure and natural porosity of the materials. – It does not form film, allowing the breathability of the substrate. – Product of high resistance to the continuous mechanical action/abrasion and of high durability. – It totally resists to UV radiation. The structure of the compound has no weak points which can be attacked by UV radiation, and therefore, the resistance to external agents is much higher than its competitors. – Do not change at all the appearance, colour or structure of the treated substrate (in any case may cause a slight change in the tone of the material, nearly imperceptible). – Unlike traditional products, it can be perfectly reapplied without removing the previous product remains. – The compounds do not react with the treated surface, maintaining the substrate unaltered..
– Product of easy application , since it is ready to be directly used without dilution.